If you're looking to make a cute DIY bathing suit cover up for a little girl - you're in luck. I have an easy tutorial on how to make a bathing suit cover up out of a full size beach towel. 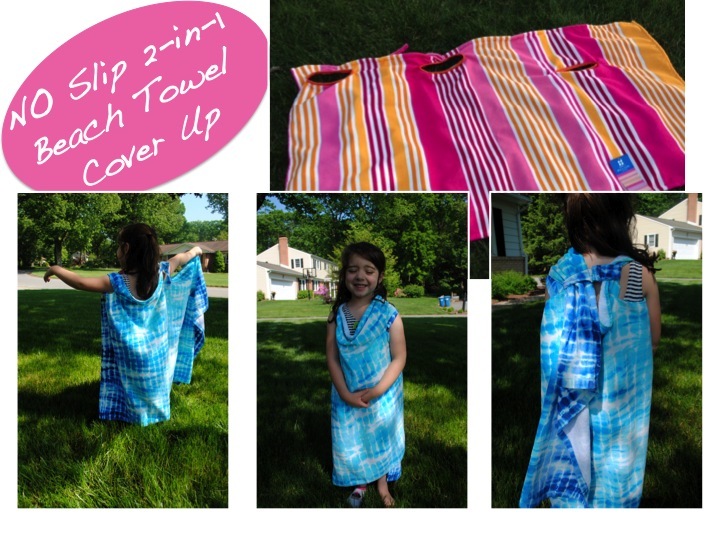 The beauty of this cover up is that it doubles as a towel so no more towel taking over the beach or pool bag and no more towels falling off or dragging on the ground. 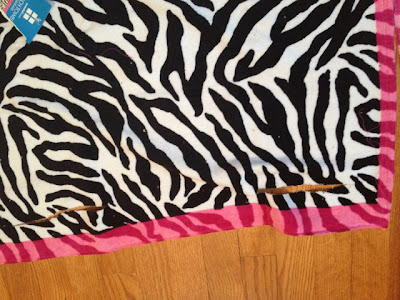 Lay your beach towel out in front of you with one of the long edges in front of you. 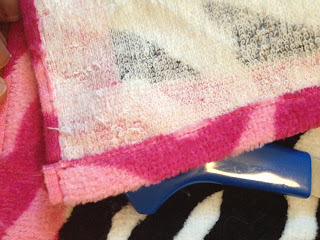 Working on one of the short sides, cut right next to the seam so the seam is included in what you cut. Keep the piece you just cut off - you're going to use it later. Now take that raw edge you are left with and fold it over twice, so the raw edge is no longer showing. 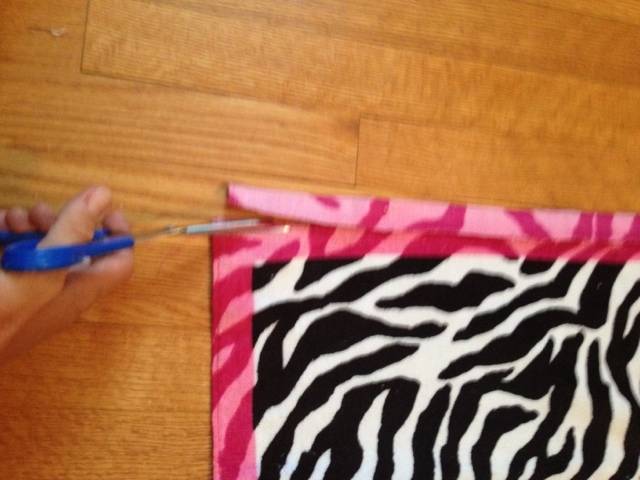 Iron it to make it easier to sew, and sew a straight line to down the edge. To make the arm holes you're going to cut three slits. Yes, I know your child only has two arms, but one of their arms is going to make a double pass through two openings. 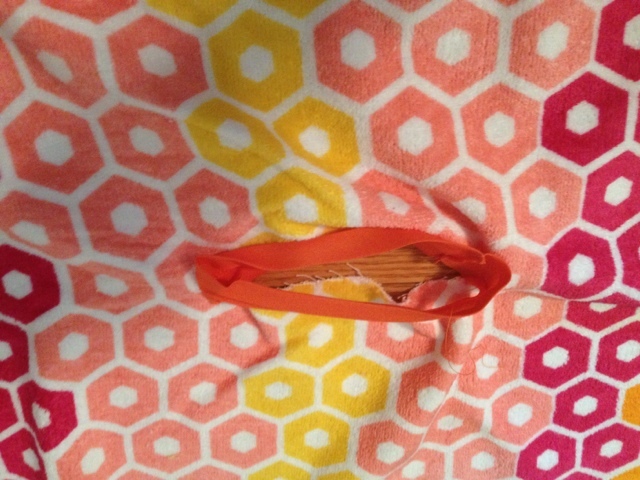 This ensures the swim suit cover up actually stays on. The first two slits are going to be even with each other. 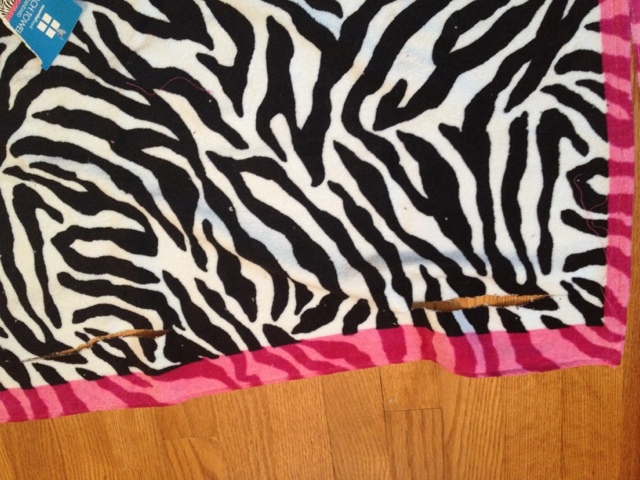 All of the slits will be horizontal (going in the same direction as the long way of the towel) Am I making any sense? Okay, to make the first slit start cutting about two inches in and two inches down from the top corner (my picture is actually upside down - obviously you could work on the bottom right corner if you wanted to too). 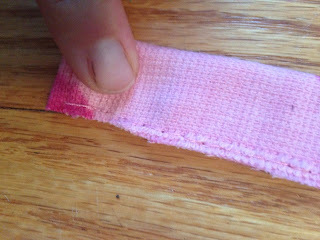 The slit should be about 6-8 inches (you should try it on for size before finishing off the arm holes to ensure they fit your child. the towel from fraying like crazy when you wash it. If you just fold it over it will be a huge mess. I am not even going to attempt to explain how to attach binding because I definitely won't do it justice. I found this YouTube video to be the best guide. 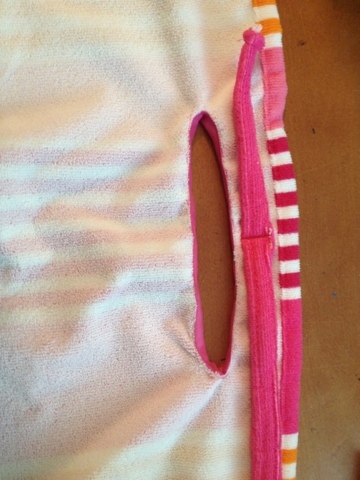 After you finish the arm holes, flip your towel over so the back is facing up. 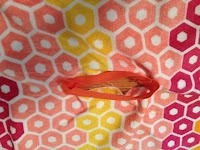 Take that edge piece you cut off and place it horizontally above the center of the middle arm hole positioning it so the right side of the tie (the one closer to the 1st arm hole you cut) is about twice as long as the other side of the tie. Now sew a vertical line down the middle to keep it in place. This will act as the bathing suit cover up's tie. 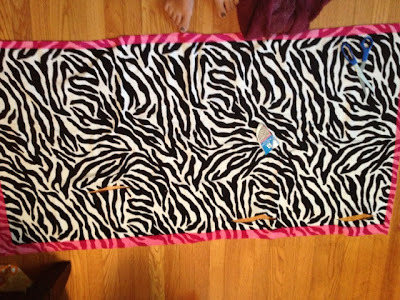 Now you have this full size beach towel with holes in it and you're probably wondering how in the world this is going to be a bathing suit cover up for your kid. Would I really lead you astray? No, of course not. 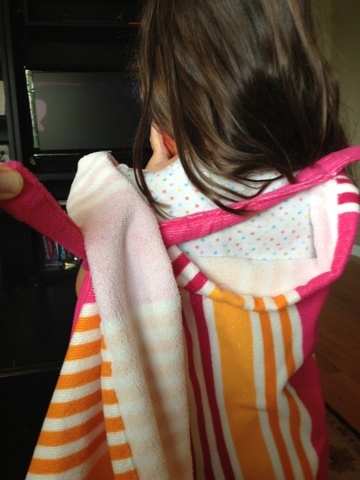 Simply have your child slip their arms through the two arm holes that are close together. Then, wrap the remaining part of the towel in front of them, slipping the left arm through the third hole. 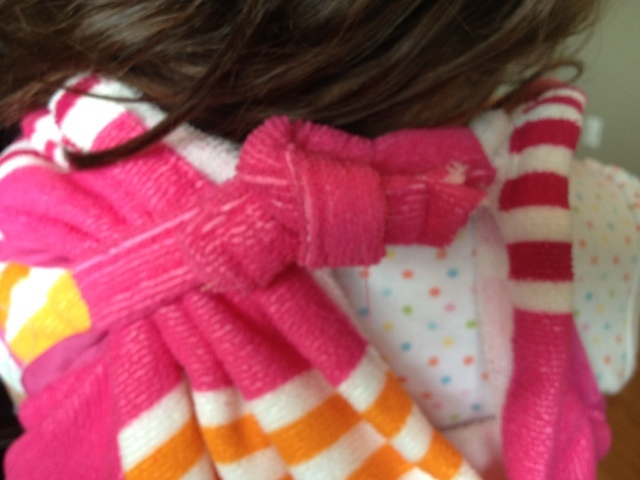 Use the left piece of the tie to slip through that second left arm hole and tie it in a bow. If you don't want to go through all this trouble, I have done it for you. 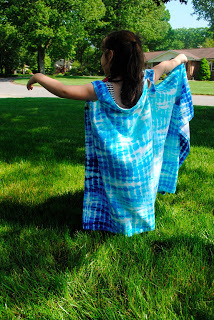 I have the no slip bathing suit cover ups available for sale in my Etsy Shop...but hurry there are only a few left in stock. Thanks for stopping by 2IY....if you like what you see we'd sure love a PIN or a Facebook share. Be sure you're following us on Facebook, Twitter, Instagram, and Pinterest.